What is the best baby monitor tablet or smartphone compatible : Withings, BabyPing, iZon or Foscam? When you have a kid, you start thinking about purchasing items that you have very little, if any, previous experience with. From diaper genies to changing tables to baby monitors, it can be hard to quickly figure out which is the best by trolling reviews on Amazon or asking friends. That’s the situation I found myself in when it came time to pick a baby monitor for our newly occupied nursery. I winnowed down the choices to four baby monitors that work with iPad, iPhone or any smartphone or tablet, a must for me. They consist of several bespoke monitors and one plain old security camera. The cameras that I ended up pitting against one another are spread across a wide spectrum of price and a surprising amount of overlap when it comes to features. The units we’ll talk about today are the Withings Smart Baby Monitor, the BabyPing, the Stem iZon and the Foscam FI9820W, which is really a security camera and not a baby monitor at all. In addition to being able to view them on a device, I also wanted to make sure that each had audio monitoring, motion sensing and infrared (night vision) capabilities. The truth is that each of them has their pros and cons, but the most expensive and feature packed model might not be the best for you. In fact, it very well could be the opposite. The BabyPing is easily the best looking monitor in this bunch. It’s got a cheery stars-and-clouds molded plastic face and a friendly dome-shaped camera enclosure. The camera is surrounded by a crop of LEDs and the face has two holes, one for light sensing and the other a microphone. On the back has a mounting point, which features a standard 1/4 20 bolt hole. The ethernet port and DC power jack are also back here. There’s a reset button on the side of the unit, but hat’s about it though, as the BabyPing keeps things simple. The BabyPing features background audio and vibration alerts, audio streams, night vision, WiFi connectivity, a password lock, audio filtering to keep out the background hiss of noise and direct-from-iOS device setup. It does not work with Android devices, so that’s out. The unit comes with a nice bracket that features a multi-angle ball-socket and rigid brace. It’s clean, well designed and easily mountable to a shelf or wall. You also get a few cleanly designed cable clips that let you route your cabling up a wall and keep it from dangling. There’s also an included USB extension cable so you can keep your iPhone or iPad juiced up while you’re monitoring, which is a very nice touch. The BabyPing must be plugged into your router with a physical cable in order to set it up the first time. After that it’s portable anywhere that your WiFi network reaches. Or you can leave it plugged in if that’s your wish. I’d like it better if the BabyPing allowed for setup over WiFi alone by creating a temporary one on first startup, something that the iZon does, as it lacks an ethernet port. But the process isn’t too bad and moves along quickly. BabyPing cannot be used outside of your home network for monitoring while you’re away. This means it does not make a good ‘nannycam’ or double as a remote monitor. The interface of the BabyPing app is simple, with a button to snap an image, switch between audio and video monitoring and a power button. In a relatively non-standard bit of interaction, the power button also exits the app. The color on the BabyPing was mostly good, but under standard tungsten lighting it’s a bit pinkish in hue. The night vision mode is quite good, reaching across a 12 ft. room easily. One of the biggest downsides I found to the BabyPing is that there is a relatively significant lag in transmitting an image, even when both ends have a great WiFi connection. Easily 4-5 seconds between something happening and it registering on the monitor. Not make or break, but that’s a few seconds that your baby might be in distress before you see it, so it’s something to consider. The BabyPing also does not offer many of the ‘baby monitor’ perks that have become common in hardware monitor systems like playing nursery rhymes from a speaker or two-way audio that lets you speak to your baby through your iPhone’s microphone. But it is clean and simple, great to look at and has very decent image quality. The app is uncomplicated and easy to use and the unit is very portable. If you want to use it on another network though, remember to bring along an ethernet cable and be prepared to find the local router to set it up. 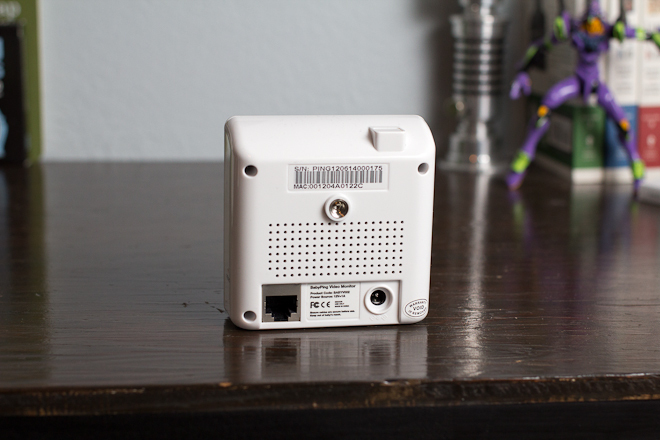 The BabyPing runs $249, which is about the midline for most dedicated network-connected baby monitors. The Withings Smart Baby Monitor is the feature-packed gorilla of this bunch. It’s jammed with all kinds of sensors, is the only unit here to be battery powered and allow for local connection over Bluetooth and has a great app. It’s also the most expensive. A clamshell design makes the Withings stand out from other monitors. It flips open and can sit on its bottom, or it comes with a clip that mounts to your baby’s bed, which we do not recommend you do. No baby book or advice giver of any sort will tell you to attach anything to your baby’s bed if you can avoid it, so you should probably place it away from the bed instead. There are several unique things about the Withings that aren’t present in any other monitors that we tested. There is a temperature and humidity measurement for one, as well as a dual input microphone and a speaker that you can use to send preset or customized lullabies, or to talk directly to your baby. There’s also a nightlight that you can customize the color of, separate from the infrared night-vision lamp. The rechargeable battery is quite cool for remote use. You pop the casing shut and truck it to the grandparents house and you can pop it open wherever you like. And the Bluetooth connectivity means that you don’t have to adapt it to their WiFi network, you can just hook it right up directly to your iOS device. If you go to a few houses regularly, you can store up to 3 WiFi networks at once and transfer between them at will. The battery isn’t massive though, and only lasts an hour with video and two hours with audio. The touch sensitive panel on top features buttons that control the light, volume and lullaby playback. If the monitor is closed, you can still use it to monitor audio. One big irritation in the Withings design is that you must have the device in fully open position and angled downwards slightly to avoid huge blowback from the built-in infrared lamp bouncing off of the white surface of the lower casing. I was wondering just why the image looked so terrible at night from this unit, which otherwise works great. Once I’d made sure it was open fully and angled, the image cleared right up. It’s an awkward design flaw for an otherwise great little unit. There’s also a quirky thing where, after a few minutes, it will lower the power output of the infrared lamps, causing your picture to dim, even when plugged in. I don’t know why it does this, but it’s annoying and you have to zoom in and out (pinching the picture) to get the lamp to fire back up. The delay in this unit was not nearly as bad as the BabyPing, perhaps 1-2 seconds or a bit more for the most part. All of the standard stuff is included as well, including push notifications and alerts based on noise and movement. There’s also thresholds for temperature and humidity, which is cool. And motion and audio levels are logged over time for you. The Withings also lets you, via an account, log into your monitor from wherever you are with the proper password. This seamless access means that your stream is traveling through Withings service, in case that bothers you. Other IP-based cameras will also allow you to do this, but they require manual configuration of your router to do so. The Withings is a feature packed monitor that runs $299, making it one of the most expensive we’ve seen. But there are a lot of sensors and convenience features, as well as minimal lag. The image quality is solid outside of the night-vision issues and decent at night once you figure out the tricks. Just like the last item in our roundup, the Stem iZon is not actually a baby monitor. Instead, it calls itself a ‘remote room monitor’. Still, the app features many of the same capabilities and it has a small footprint. The biggest downfall of the iZon as a baby monitor is that it has no night-vision mode, which will kill it for those looking to peek in on their baby in the dark. It should work for daytime or dim viewing though. The iZon features the nastiest lag of any of these monitors too, with almost 10 seconds lag in the feed. That can be a very long time if your baby is choking or having other problems breathing. The iZon has a nicely designed magnetic base that lets you position it at an incredible variety of angles, provided that they’re between around 45 degrees and 90. The stick-like shape features a camera and microphone hole and a cord coming out of the back for power. The charger is an iPhone-style dongle type which lets you plug it into the wall or a computer for power. The iZon does motion detection and audio detection and can send you alerts. It also is the only one of these offerings to feature an online interface that lets you do all kinds of cool things, including recording video for later viewing. The image quality is also pretty darn great. Like the Withings, you can log in to your iZon account and watch your stream from anywhere, with no complicated router fussing. The lack of night-vision and relative lag makes this guy the weakest contender as a dedicated baby monitor, but as a room monitor it has its charms, especially as its mounting system is so flexible. It’s also cheaper than the previous monitors at $129.95 and you can get two of them for $199. Foscam is a Chinese company that sells its cameras directly and through retailers like Amazon. It is not a dedicated baby monitor, and it doesn’t bill itself that way. This a pure IP security camera meant to be used to keep an eye on property. But my buddy Bob had been using one in the home so I decided to try one out in the baby monitor role. And what a pleasant surprise it ended up being, this thing is great. The outside package is pleasant in an industrial sort of way, although it is bigger than any of the other monitors aside from perhaps the Withings. I probably should have bought the white one, but I got a discounted 2-pack online so I can use one of them as a security camera too. The Foscam is packed with features. It has a built-in microphone and speaker, as well as a mic and speaker in/out port if you’d like a remote of either attached. It’s also the only one of these monitors that features full pan and tilt control from any of the dozens of apps that are compatible with it. Being able to look around isn’t that big of a deal for a sleeping baby, but once kids start to move around it could come in handy. And, of course, that comes in handy for a security camera. It features an external antenna as well, which has fantastic range. There is an ethernet port in the back of it, which I recommend for setup even though the Foscam comes with a disc full of crappy software to help you configure it over the air. The setup of the Foscam is probably its weakest link just because it’s super simple for nerds who have played with a router in the past, but offers next-to-no automation or setup wizardry like the others do. If you have some basic technical acumen, you’ll be fine. But pain-free setup this is definitely not. That being said, there are plenty of guides out there about how to set up the Foscams, as they’re very popular. A beefy ring of infrared emitters bathes the room in light, making for a great night-vision picture. The daylight image quality is also second-to-none. And, most importantly, there is almost zero lag in the transmission of the image, providing a near-realtime picture. The Foscam does not have a dedicated app, instead relying on a variety of third-parties to provide apps that are compatible with it. In fact, nearly any of the generic ‘security camera’ type apps will work with the Foscam. There are even some dedicated baby monitor-style apps that have features like lullaby playback and logging of activity that you can use with the Foscam to approximate the features of apps like the Withings or BabyPing. I chose the straight-up Foscam Pro, which gives you all of your controls on one page, including pan/tilt, preset locations and detection based on motion and sound. The Foscam pro app even does face detection and allows you to capture images, 10s or 60s of video on motion. There’s also a ‘motion follow’ mode which will automatically track a person in the frame, but I didn’t try it. You can record video or stills right to your camera roll. The two-way audio feature lets you speak or play audio back to your baby as well. There is a web interface for most of the basic features. The Foscam is also compatible with any smartphone or tablet that you can use an IP camera app on, and there are plenty for Android and iOS. You can access the Foscam over the internet anywhere from your device, but you have to port forward using your router, so you’ve got to be comfortable either knowing how to do that or learning how. The Foscam FI8910W is easily the cheapest of all of the monitors in this list at $99 or even less, and its got a great set of features. The BabyPing looks great and has a simple app, but the Withings takes the cake for the features and it packs a huge array of sensors. The battery powered Bluetooth mode also makes for a nice portable option. But its price may put some off. If that’s the case for you, or if you like the idea of being able to use any one of a variety of apps that have their own features, the Foscam is an attractive alternative. It’s cheap, and it’s the only motorized option here. It requires more fiddling than the other options here, but it’s pretty great overall.